U.S. Customs and Border Protection said 4 pounds of cocaine was found sewn in the linings of children's clothes at Houston's George Bush Intercontinental Airport on Oct. 3, 2016. 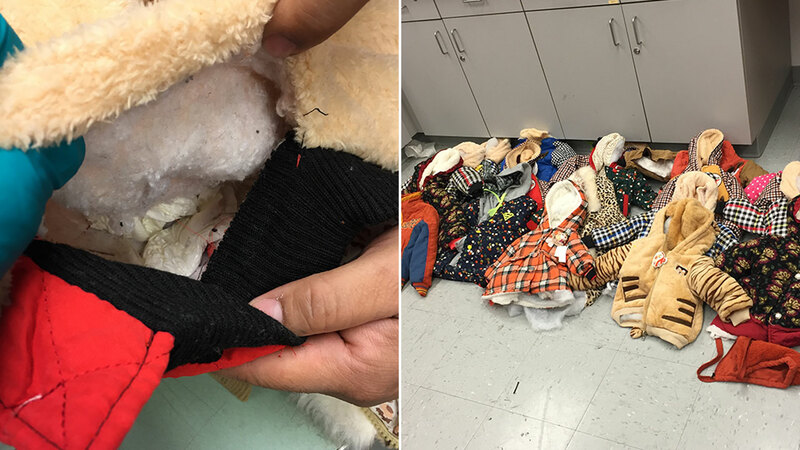 HOUSTON, Texas -- More than 4 pounds of cocaine was found sewn in the linings of children's clothes being smuggled through a Houston airport on Monday, according to officials. The U.S. Customs and Border Protection said officers stopped two U.S. citizens traveling from Peru to Houston's George Bush Intercontinental Airport for a secondary screening. Authorities said the two suspects, both in their early 20s, provided inconsistent and false statements to officers, leading to a search of their luggage. When officers searched their luggage, they said several children's winter coats were oddly weighted and smelled of vinegar and perfume. Officers inspected the coats and said packages of cocaine had been sewn into the linings of the jackets. The two suspects were arrested and handed over to state authorities.